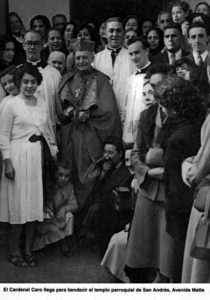 The Columban Fathers were established in 1918 as the ’Maynooth Mission to China’ and the first group of missionaries went there in 1920. 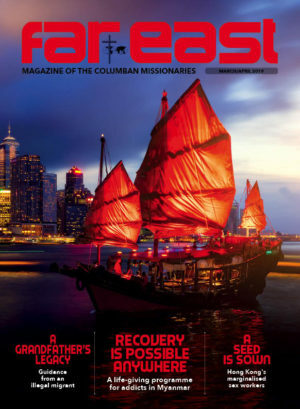 China remained the main focus for the next 34 years but in 1929 they took on a parish in Manila as a ‘support centre’ for the China mission and their presence in the Philippines gradually increased to become its second largest mission. The expansion outside an increasing disturbed China was due to the difficulty in placing all the new missionaries there and to provide an alternative to those unable to return to China for health reasons. 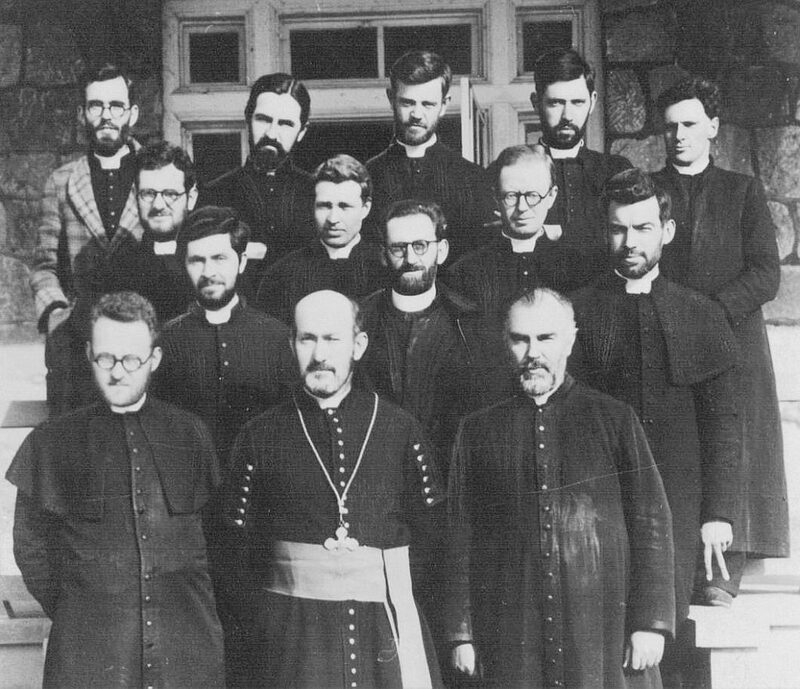 Florian Demange, vicar apostolic of Taegu, with the first group of Columbans in Korea in 1933. 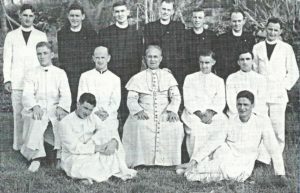 Seated: Thomas D. Ryan, Owen Macpolin (superior), Demange, Patrick Dawson, Patrick Monaghan. Standing: Harold Henry, Jerome Sweeney, Gerard Marinan, Brian Geraghty, Thomas Neligan, Daniel McMenamin. The next mission was Korea (1933), which provided a situation and culture similar to China’s, and then Burma in 1936 and Japan in 1948. 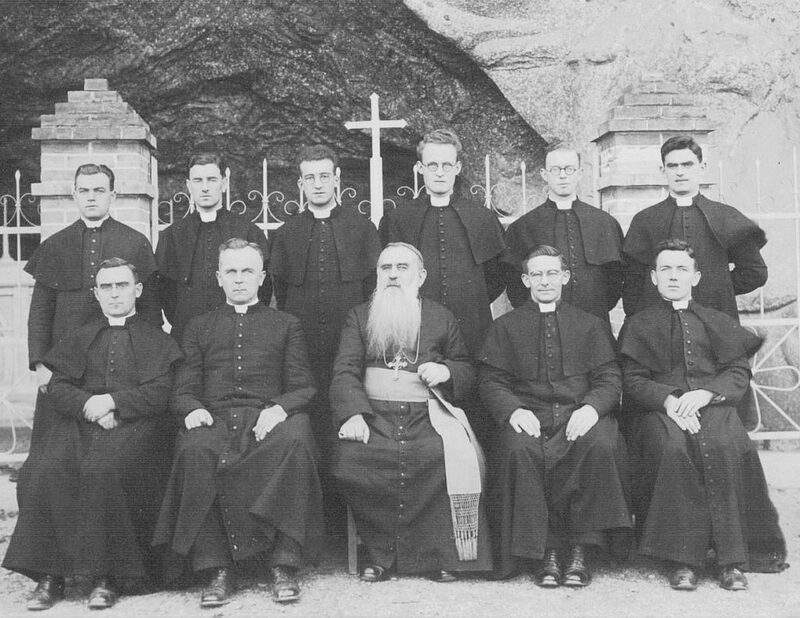 A Japanese propaganda photograph of priests of the Prefecture of Ch’unch’on interned in 1942. Front row: Brian Geraghty, Thomas Quinlan, Pat Brennan. Second row: James Maginn, Frank McGann, Tony Collier (giving the victory sign). Third row: Pat McGowan, Phil Crosbie, Tom Neligan. Fourth Row: Paddy Deery, Frank Herlihy, James Doyle, Frank Gallagher, Hubert Hayward. 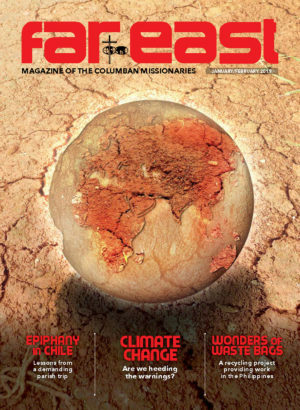 In 1951, a request from Fiji brought Columbans there and following the Pope’s appeal for missionaries for South America, Columbans went to Chile and Peru in 1952. In 1970, a return to non-Christian countries was made when small groups (Mission Units) were sent to Pakistan and Taiwan. 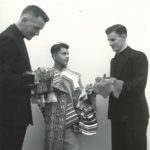 In 1986, a Mission Unit was set up in Brazil for involvement in the exciting new Church movements in Latin America and in 1985, Jamaica and Belize provided opportunities for older men who wished to return to the missions without the onus of learning a new, difficult language. When China reopened to the wider world in the 1980s, a Mission Unit was set up in Hong Kong (1989) to follow up on the new opportunities on the mainland. 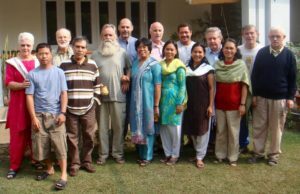 When a similar reopening occurred in Burma (now Myanmar), a Mission Unit opened there in 2016.